Like the Massaud design line, Urquiola does not only include faucets, but can also perfectly combine with matching designer washbasins and bathtubs. The products of the designer Patricia Urquiola are characterized by extraordinary and traditional forms. The motto of the line is "eclecticism", i.e. taking up familiar forms and combining different eras and cultures. 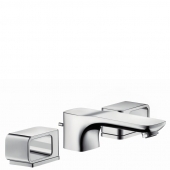 The handles of the washbasin faucets are inspired by handles of scissors. Washbasins and bathtubs, which are curved shapes, resemble a washtub and also have handles, integrate beautifully into your modern bathroom. Even small details are not neglected: there is hidden and inconspicuous H symbol for hot water and C for cold water on the handles. 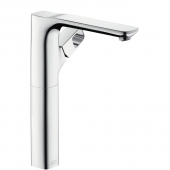 The Urquiola line offers a standing washbasin faucet as a single lever mixer for washbasin in several heights: projection 114 mm, 139 mm or 198 mm. The faucets have an asymmetrical shape. 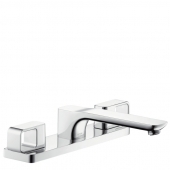 The 139 mm version is also available as a two-handle version with an asymmetrical shape (different handle heights). 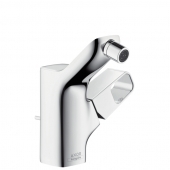 The three-hole faucet for mounting on the edge of the washbasin is more exclusive. Handles and spout are individually mounted on a single plate. This has a length of 394 mm, with the handles on the right and left protruding slightly above the plate. The projection of the spout is 180 mm. The three-hole version is also available for wall mounting and has a projection of 168 mm or 228 mm. 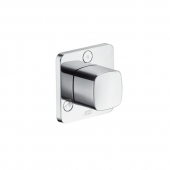 The single-lever mixer for wall mounting is also mounted on a plate and has an asymmetrical character due to the one-sided handle. The projection of this variant is 200 mm. 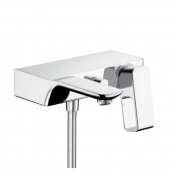 All washbasin faucets of the Urquiola product line have a normal jet. 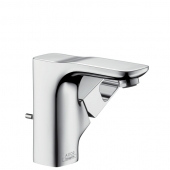 The faucets consist of a straight base from which the outlet flows gently forward. 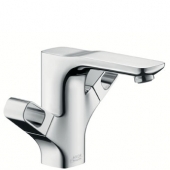 Characteristics are the rounded corners and edges, which give the faucets a soft form. 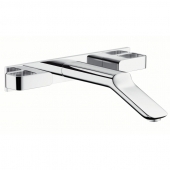 The scissor handles also appear in the shower whether for the single-lever shower mixer for deck or wall-mounting installation. 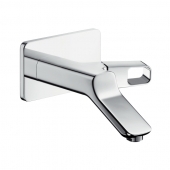 The thermostat faucets also have the scissors handle and rounded corners and edges. 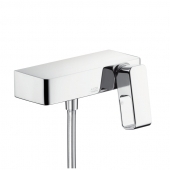 The shower faucets can also be combined with showers from other series such as Axor Starck or Raindance. Urquiola offers a shower head holder that takes up the typical shapes of the series. 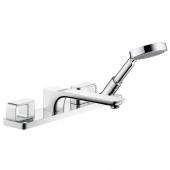 The Urquiola product line offers many options for the bath faucets: a three-hole bath rim mixer with inlet and two rotary handles as well as a four-hole bath rim mixer with additional shower head. This variant is also available for the tile edge. 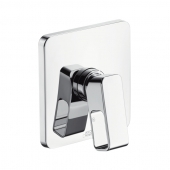 Alternatively, a single-lever bath mixer for surface or in-wall-mounting installation can also be chosen. The floor-standing bath thermostat is particularly recommended in combination with free-standing bathtub of the series. 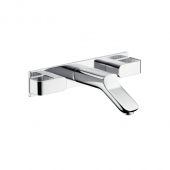 It takes up the scissor handle and the natural shapes of the rest of the series and consists of a foot, a thermostatic mixer, a hand-held shower and a shower hose. 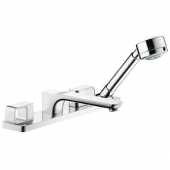 If you like it to be more personalized, you can also combine the individual bath spout with a faucet. 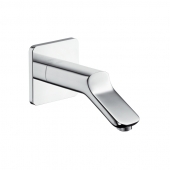 The bath spout has very dynamic shapes and smoothly bent with soft curves. The bidet mixer is asymmetrically formed and produces a laminar jet. The scissors handle is located on the right side and the spout is swinging upwards at the front. This is where the ball joint jet former is located, which provides pleasant use thanks to its swiveling capability. Urquiola offers washbasins that are reminiscent of a historical washing trough and therefore revived a classical form again. The countertop washbasins are available in three sizes: 511 mm x 427 mm, 624 mm x 408 mm and 624 mm x 399 mm. A wall-hung washbasin is also available in the last size, right and left two handles are attached, which can serve as a practical towel holder and provide an extravagant look. The nostalgic freestanding bathtub of the Urquiola line has an elongated backrest for comfortable sitting on one side and a handle that is ideal for a bath towel on the other. This means that it is immediately ready to hand when the bath is finished. The filling height of the tub is 340 mm. Overall, the tub is 1820 mm long, but the floor area is only 1335 mm long, as the sides are dynamically inclined outwards. 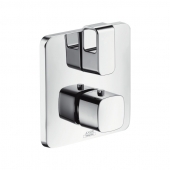 The asymmetrical design is also shown here: the tub height on the handle side is 690 mm and 870 mm on the other side. 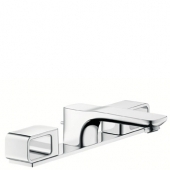 The product line Urquiola also offers swinging and asymmetrical bathroom accessories. 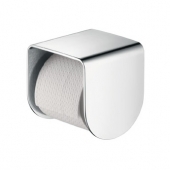 These range from soap dishes and paper roll holders to towel holders and towel hooks. 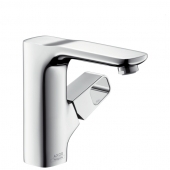 All accessories can be color matched to the faucets by selecting one of the 15 Axor colors.